Amakusa is a treasure island surrounded by ocean and dotted with mountains! We welcome you to visit our island to create great family memories. Why not give your loving family a holiday filled with wonderful memories to cherish forever? A trip full of happiness, joy and laughter! Take a vacation to make great memories with your family. From check-in to check-out, your stay at Igaya will be full of wonderful moments to remember. Enjoy your journey to Igaya! Your holiday begins the moment you step out of your home! 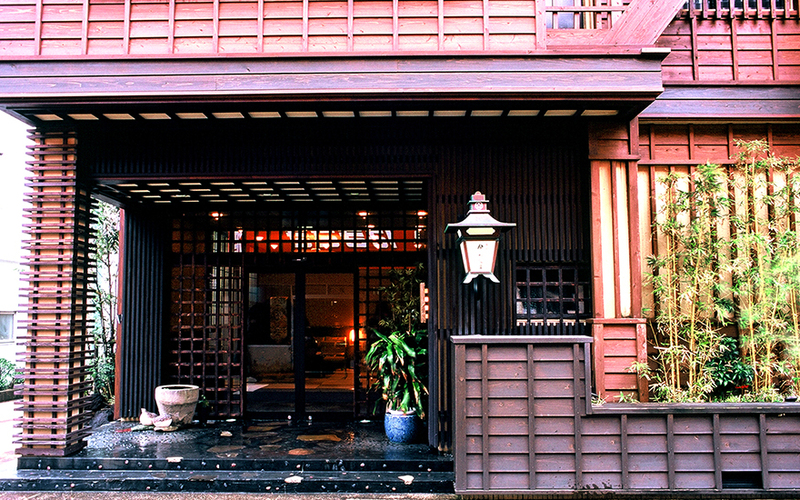 You can visit our ryokan in Amakusa by various travel options: car, ferry, air, or a sightseeing train are all available…. 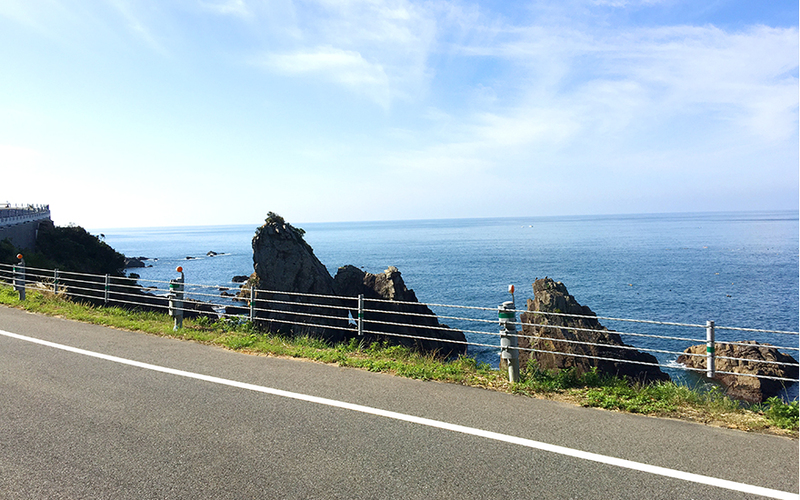 By Car Have fun chatting or singing, and spending quality family time while driving to Igaya. Amakusa islands are connected to Kyushu Hondo (mainland) via the “Amakusa Gokyo” (The Amakusa Five Bridges). It takes approximately 2.5 hours to drive to Igaya from Kumamoto Station and approximately 2 hours to drive from the Matsubase Interchange. By FerryThe ocean is considered as a “path” for the people of Amakusa. Historically, it has been a passage that connects us to the world. Travelling across the sea will give you an extraordinary experience and will surely be a special moment to remember. and enjoy your journey with the splendid view of Amakusa from the sky. 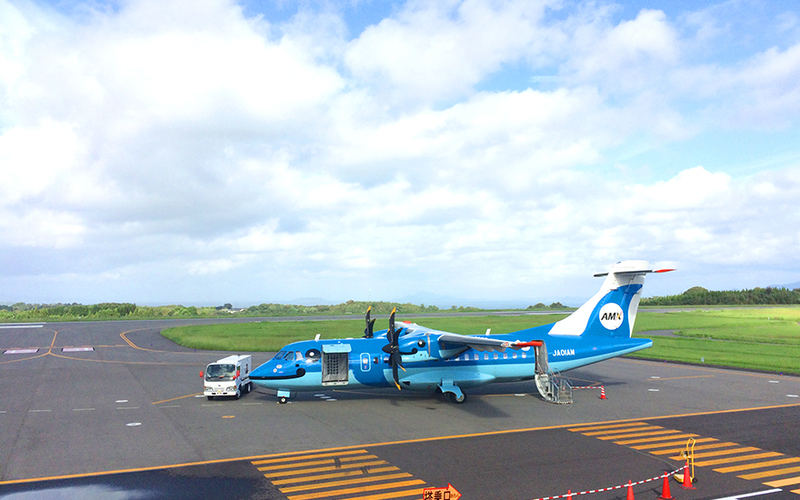 The air travel to Amakusa will make you feel like you are on a sightseeing flight. The flight to Amakusa Airport takes approximately 20-minutes from Kumamoto Airport and approximately 35-minutes from Fukuoka Airport. 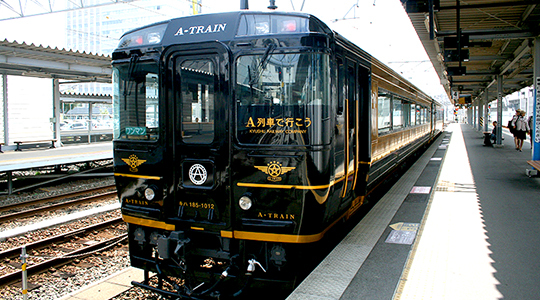 By Sightseeing Train & Sea-cruise Express Ferry ServiceImagined Amakusa during the great voyage "Let's go by train A"
“A Ressha de Iko” (Take the ‘A’ train) is a sightseeing train that runs between Kumamoto station and Misumi station. This special train, designed after the image of Amakusa during the world exploration period, has a bar and will give you a sense of excitement from the moment you step on board. From Misumi station you need to take a short walk to Misumi port to catch the express ferry service called “Amakusa Takarajima Line” and continue your journey to Amakusa by sea. Please enjoy the breathtaking scenery on your way here. Checking in to Igaya ? a Japanese style ryokan that will offer many great moments to remember. 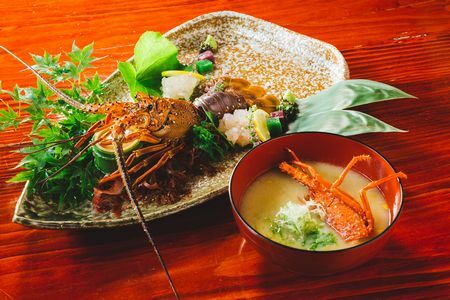 We are the longest established ryokan in Shimoda Hot Spring Village in Amakusa and are proud to present our guests with the splendid local seafood cuisine prepared by the same chef as Gosoku-no-Kutsu (our affiliated hotel). From start to finish, we hope your stay at Igaya will be filled with wonderful moments. Take a memorable family photo with your head through a comic foreground! We have created an original comic foreground resembling the image of a family trip during the Meiji era (1868~1912). 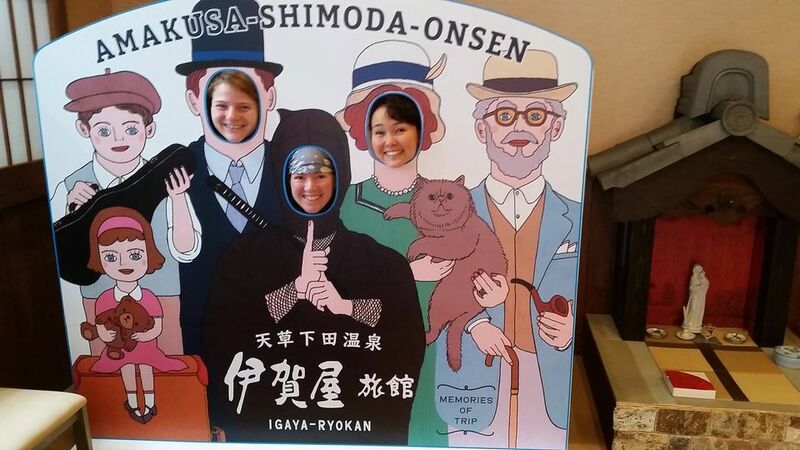 Take a commemorative photo with this fun face cut out and transport your family back in time to the Meiji era! Relax by bathing in the natural hot spring water. 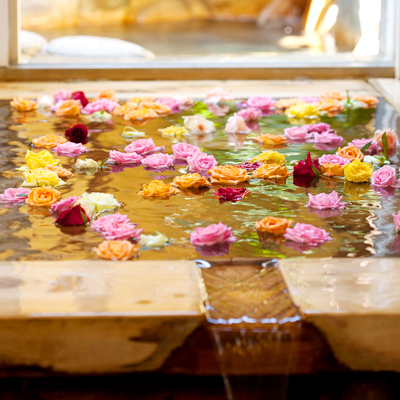 Spend a soothing time soaking in the soft and smooth Shimoda hot spring waters. Japanese often talk of the virtues of “naked communion” for breaking down the barriers. Enjoy chatting in the relaxed atmosphere. Slip in to your complimentary yukatas (traditional Japanese cotton robes) once you are out of the hot springs and you are all set to have more fun. Put on a pair of geta (Japanese wooden sandals) and enjoy the evening sunset! 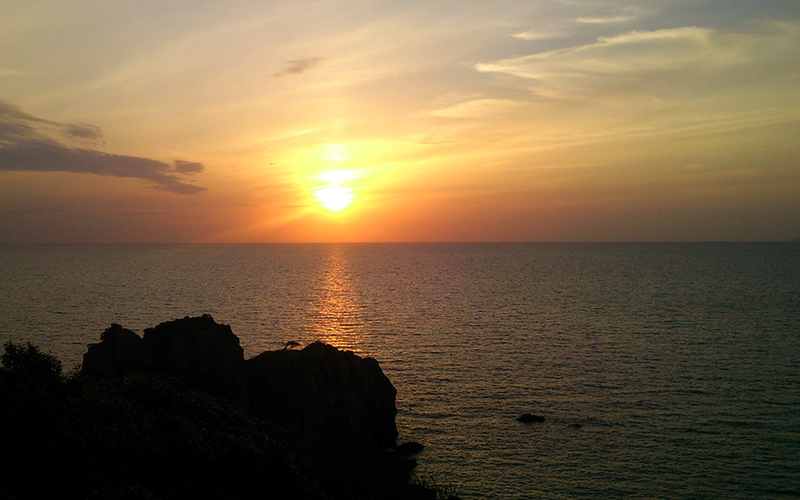 Take a 10-minute walk from Igaya and catch the magnificent view of an evening sun setting in to the East China Sea! Top off your special day by admiring the beautiful evening sun bathing the surroundings in orange as it sets over the sea. Enjoy a beautiful dinner undisturbed in your own private guestroom! 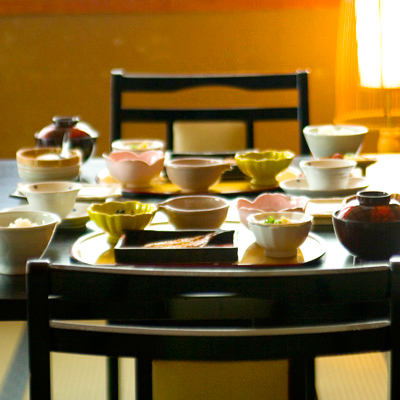 Igaya’s dinner is served in your guestroom so that you can dine undisturbed and enjoy quality family time. Best suited for groups, such as a women`s trip or for guests with young children. Ninja Plan - A wondrous dinner course, full of surprises! Smell the aroma of smoke, and dazzle in the burning flames….. Through your five senses, you can enjoy the wide variety of dishes made from the local fish of Amakusa. There will be many great photo opportunities throughout this dinner that comes full of surprises. The experience is sure to bring many smiles and fun moments! We recommend this dinner course for a big family gathering or for a wedding anniversary! The lavish course includes the two finest delicacies from the sea of Amakusa, spiny lobster & abalone. 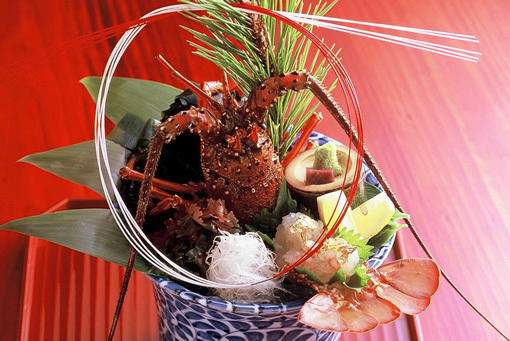 <Spiny Lobster & Abalone> are the two supreme delicacies from the sea of Amakusa. They are both considered to bring good luck and are essential items in any celebration feast in Amakusa. Please enjoy this special meal full of delicious seafood. “Ika Meshi’” (rice-stuffed squids) made by the former wholesale squid distributor! How about “Ika Meshi” made by “Ikaya” (Igaya is called “Ikaya” by the locals which means “a squid shop”) for your final course of your dinner? Squid can be caught throughout the year in Amakusa. We’ve cooked the whole squid stuffed with rice in our special “dashi” (Japanese-style stock). 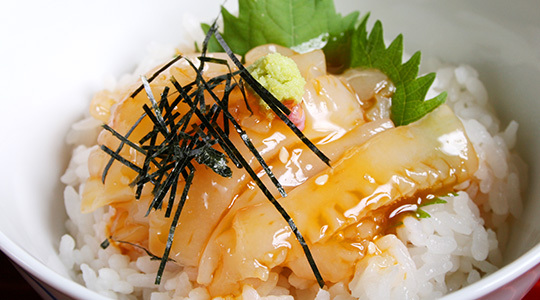 Enjoy “Ika Meshi” from the former squid specialist “Ikaya”! Round off your scrumptious meal with this delicious local seafood and you will be all set for some quality sleep. Seafood “Ikizukuri” (slices of raw seafood prepared while alive) is a must for a celebration feast in Amakusa. 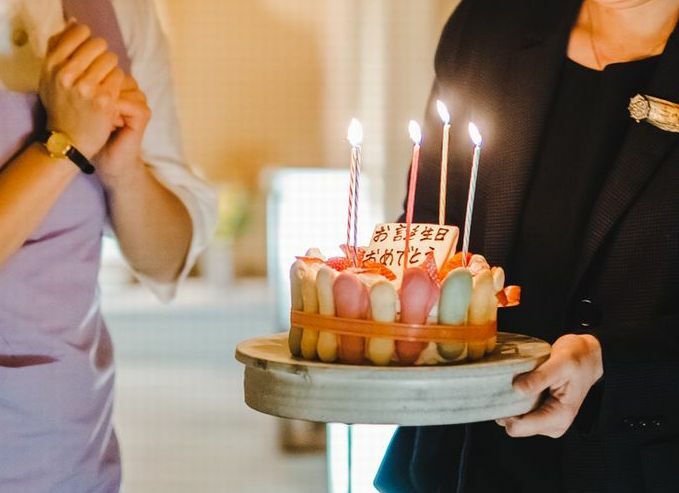 Why not celebrate your special day in traditional Amakusa style? Does your father love seafood? Wouldn`t he love a big snapper “sugatazukuri” (beautifully arranged whole fish sashimi with the head and tail attached) for his 60th birthday celebration? These special family moments spent gathering around the table will aid in ensuring your father a long and prosperous life.
. Shimoda Hot Spring Village is also a fisherman’s town. We can specially cator these special celebration dishes to suit your budget. Please feel free to make inquiries with us. We can organize birthday cakes and flowers! We will dim the lights, bring out the cake and sing a birthday song to wish that special someone a happy celebration! Watch them blow out the candle with a huge smile on their faces. We can organize cakes and flowers to enhance your special day! How about a special gift for your partner? How about a special gift of aromatherapy treatment for your busy mother? This is a great gift of revitalizing treatment time while listening to the gentle sound of the waves. 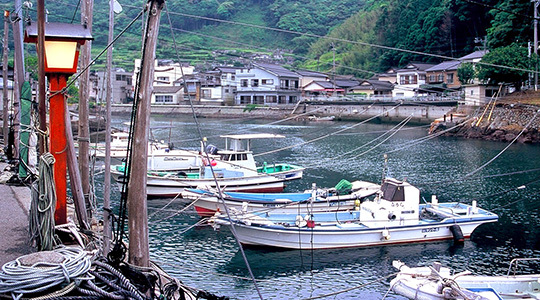 Shimoda Hot Spring Village is also a fisherman’s town. Take a 5-minute walk by the river side that runs behind Igaya Ryokan and you will reach the harbor. Beyond the harbor spreads the East China Sea where countless boats head out daily for fishing. At the port, “Ebisu-sama” (god of fisherman and luck) watches over our daily life while wishing the fishermen bountiful fishing and safe journeys. Why not take a stroll around Igaya Ryokan in the early mornings or at dusk? You will be walking through the maze of alleyways while smelling the unique scent of the seashore only to be found at a fishing village. You may see the boats returning in to the harbor and family members coming out to greet them or you may come across children walking to school with a big smile on their faces. The walk will provide you with unique scenery that cannot be found in the hustle and bustle of city life. Let’s start your special day with a breakfast that will make you smile! Start your special day with a smile and lots of joy in your heart! 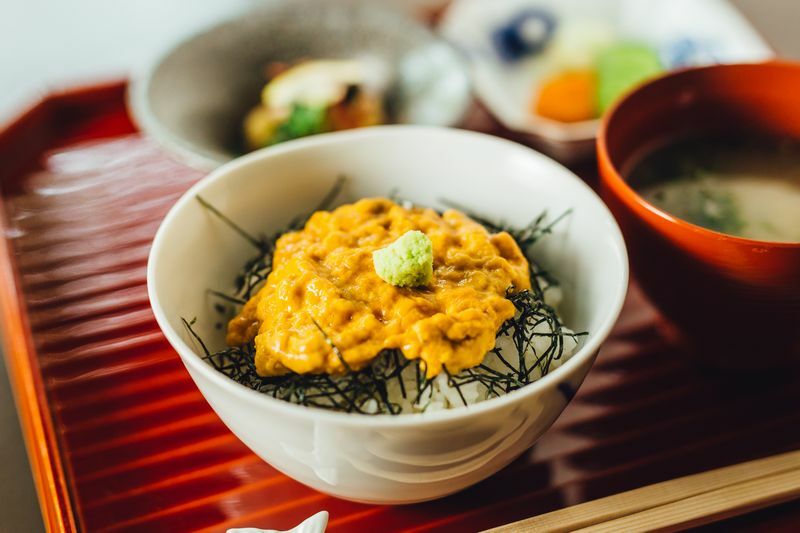 The breakfast consists of two heavenly combinations of “Aji no Mirin-boshi” (dried horse mackerel marinated in sweet rice wine) and miso soup with seaweed. 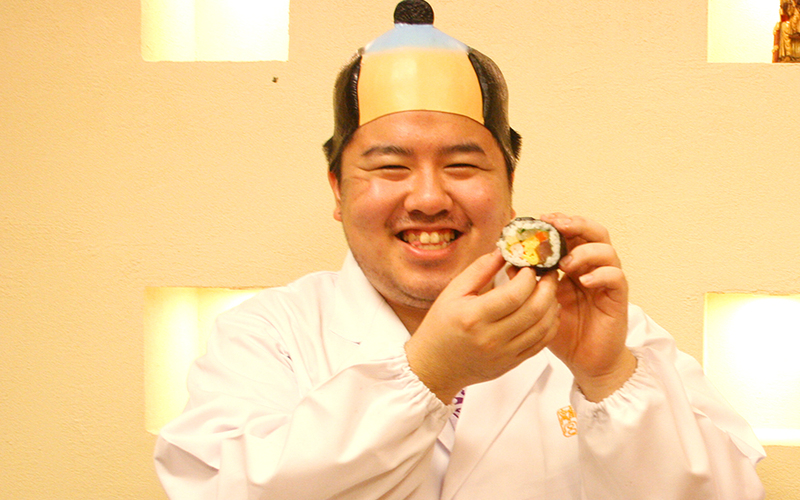 “Aji no Mirin-boshi” is prepared exclusively for Igaya by Grandma Umitsuki from Sakitsu fishing village. Please enjoy this special Amakusa breakfast. 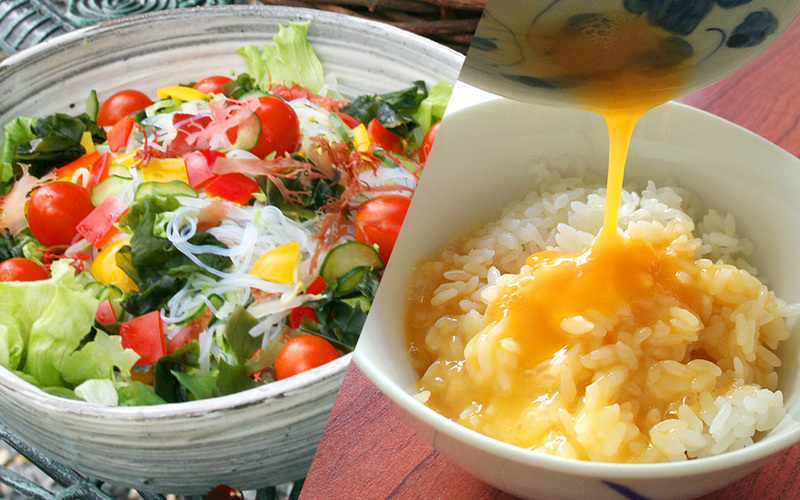 All you can eat “Tamago Kake Gohan” (rice mixed with a raw egg and soy sauce) & freshly picked vegetables! We want you to spend your entire day full of energy! Please start your breakfast by eating plenty of vegetables to aid digestion. The meal is followed with an exciting offer of all you can eat eggs! We have prepared our own special “Dashi Shoyu” (soy sauce enriched with a natural broth made from seafood extracts) that goes fantastic on the “Tamago Kake Gohan”. 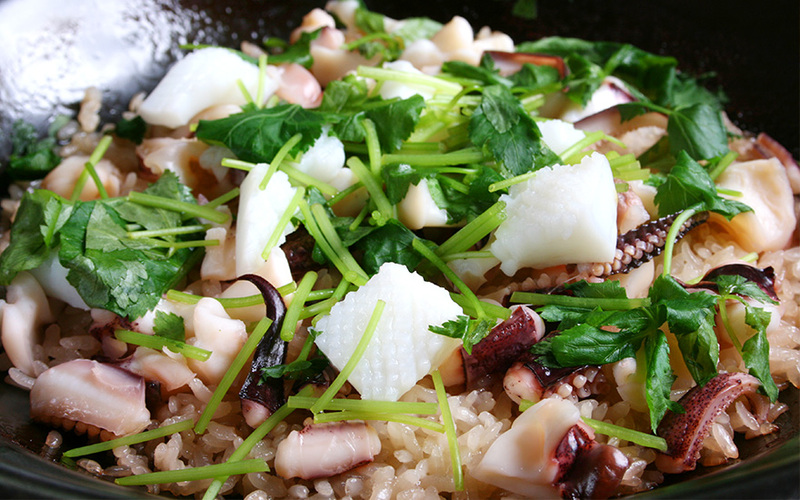 Why not start your special morning with “Mini Ika Don” (a rice bowl served with fresh squid)? Firstly, we prepare a plate of our famous squid sashimi that tastes fantastic as it is. To this raw squid we add Igaya’s original “Dashi Shoyu” (soy sauce enriched with a natural broth made from seafood extracts) and a raw egg, and serve this on top of freshly cooked rice to make “Ika Don”! Enjoying “Ika Don” for breakfast sure feels like an Amakusa way to start the morning. Amakusa has many great places for everyone in your family to enjoy. 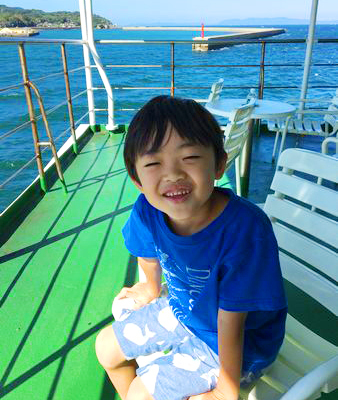 Please discover Amakusa and create many treasured family memories!